bt brinjal is a step away from becoming Indias first genetically modified food crop. Whether it will enter our kitchens, now depends on the Union environment ministry. On October 14, the Genetic Engineering Approval Committee (geac, the clearing house for all genetically modified crops in India) gave it environmental clearance. The final decision from the environment ministry is expected in February 2010. The reports that paved the way for the environmental clearance have been put up on the ministrys website, and would be open to public comment till December 31, 2009. Consultations with scientists, farmers, consumers and non-profits will follow the comments. In fact, geac could have cleared Bt brinjal when it met in January this year. geac had in its agenda test results submitted by seed company Mahyco, which has developed the crop. But two independent scientists reports showed inconsistencies in Mahycos interpretation of the test results, which found their way to the January meeting. This held up approval of the Bt crop (see Test tube brinjal, Down To Earth, April 15, 2009). The geac constituted an expert committee in May to look into the findings of the two scientists. Groups opposing GM food sought an independent review when they got the companys test results through a Right to Information petition and forwarded them to the scientists. The government-appointed expert committee did not find any discrepancy with Mahycos tests, brushed aside concerns raised by the scientists and said further tests were not required to establish the safety of GM food (see table). Studies on mammals have been restricted to a 90-day period or less which is inadequate to study long-term assessment of chronic effects Long-term tests are not required. Cry 1 AC gene is safe and not toxic. 90-120 days in a rat is equivalent to 21-25 years in humans. Cry 1 AC is shown to rapidly degrade in digestive fluids and is not detectable even in short-termstudies. Bt brinjal contains a gene from Bacillus thuringiensis, a bacterium which produces a toxin that kills the pest when it feeds on the crop. Studies across the world on rats and mice suggest Bt crops increase allergies, antibiotic resistance and internal organ damage. But GM researchers claim Bt would reduce use of pesticide and control infestation of the fruit and shoot borer disease, which affects brinjals. The benefits of Bt brinjal developed by Mahyco far outweigh the perceived and projected risks, read the report, which the committee submitted to the geac. There is no reason Indian farmers should be deprived of biotechnology any longer, said Arjula R Reddy who chaired the expert committee. But the decision is one of the biggest disasters in independent India, said P M Bhargava, Supreme Court appointee to the geac. Also the former director of the Centre for Cellular and Molecular Biology in Hyderabad, Bhargava was present at the October 14 meeting that gave the crop the clearance. His, and other scientists primary complaint was the Mahycos tests were not enough. Bhargava said he had suggested the committee summon the two scientists and Mahyco to present their facts. The face-to-face never happened, and the committee analyzed the same data Mahyco had given, while rebutting the scientists concerns, he said. Mahyco did not take into account significant differences in clinical signs and biochemistry parameters in the blood of animals who were fed Bt brinjal and those that were not, during the clinical trials for three months, said Gilles-Eric Seralini of the Committee for Independent Research and Information on Genetic Engineering in France. Long-term chronic toxicity tests should have been done. Three months is too short a period to assess the safety of the food product. Scientists concerns were invalid. Farmers here should not be deprived of bio-tech any longer. He and Judy Carmen of the Institute of Health and Environmental Research in Australia were the independent scientists who reviewed Mahycos test results. Mahycos tests were not adequate, added G V Ramanjaneyulu of the Centre for Sustainable Agriculture, a non-profit in Hyderabad. Similar tests on Bt cotton could not capture the problem which led to sheep deaths. Three months is too short a period to assess the safety of a food product. Long-term chronic toxicity tests should have been done, he said. But the expert committee was of the opinion that the 90-day tests by Mahyco showed there were no significant differences between Bt brinjal and non-Bt brinjal. Bhargava said that of the 22 tests recommended, Mahyco carried out two. Even these were done by companies and not independent research bodies, he said. P Balasubramanian of Tamil Nadu Agriculture University refuted this The tests were conducted by independent bodies and met international standards. Mahyco partnered with the university to develop Bt brinjal. According to Ramanjaneyulu, it is not just about international standards; it is about how independent and comprehensive a study is. Mahyco should have factored in local ways of growing and consuming crops. In the US, machines work in cotton fields. In India, farmers do, so, you cannot ignore allergenicity tests among workers. But the expert committee does not seem to be in a mood to accept these suggestions. In its report, the committee said Bhargavas call to raise the regulatory bar detrimental for research and development in the area of agricultural biotechnology, especially for public sector institutions. This debate would be taken up in Parliament, said Prasenjit Bose, convenor, cpi (m) research cell. We oppose the manner in which the trials have been done. They were neither transparent, nor democratic. However, the larger issue is of proper biosafety tests and an unknown outcome of genetic modification, he said. The cpi (m), through its farmers wingAll India Kisan Sabhais planning a meeting to garner support of farmer organizations in the country to arrive at a joint statement. They would post the statement as comment on the environment ministrys website. In case Bt brinjal gets approval from the Centre, it will depend on states to decide whether or not they will allow cultivation of GM crops within their boundary. It seems they are in no mood to wait for the final decision. Kerala is exploring options of a law to make the state a GM-free zone. Orissa and Andhra Pradesh have also opposed the clearance. The Andhra Pradesh government has formed a committee comprising members of state agriculture and horticulture universities for their opinion on the studies carried out. Non-profits in Rajasthan have issued a joint statement demanding a high-level review of the clearance. Their stand is GM food would lead to pollution and contamination of other varieties. Mahyco has not followed international rules for Bt tests. It is a scientific and historical error to neglect significant health effects. 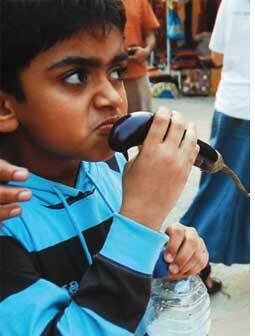 States are also concerned because consumers would have no way to find out if the brinjal they eat is transgenic. Non-labelling makes Bt brinjal more unviable. Activists said the Centre should not clear the GM crop till strict provisions on labelling were in place. But, said Bose, labelling will work on processed, packaged food. How do you label fruits and vegetables in mandis? February might reveal the answers. Jairam Ramesh, minister of state for environment and forests, at a public meeting in June had said GM food is not okay. If he overrules geacs decision, nothing much changes. If he does not, it might raise hopes for 56 other GM crops, including okra, rice, mustard, cauliflower, tomato, which are in various stages of trial in the country.